As one of the most prestigious chemical trade shows, the Khimia international exhibition 2018 was completed perfectly in Moscow yesterday. Held from Oct. 29 to Nov. 1, the four-day event covered all sectors of the chemical industry, offering a full picture of the current accomplishments of the chemical science used in various industries. 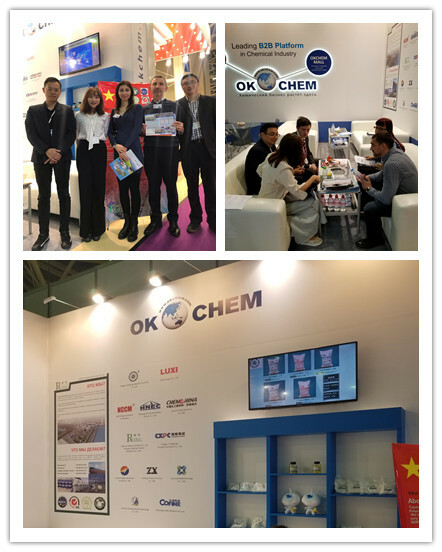 As the leading B2B platform in chemical industry, OKCHEM also participated in this exhibition and showed at booth 22B72. 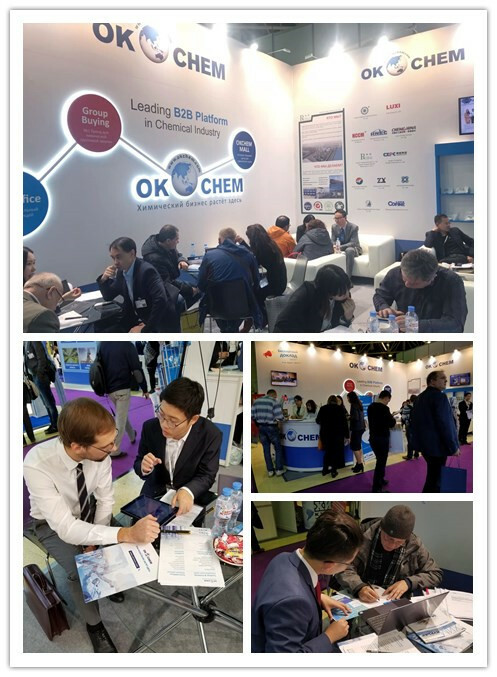 Positioned in the entry of the exhibition, OKCHEM caught attentions from many chemical buyers and suppliers, and attracted over a thousand of visitors from Russia, Belarus, Germany and other countries, with 76% of buyers, 10% of suppliers, and another 14% of various localized marketing partners. 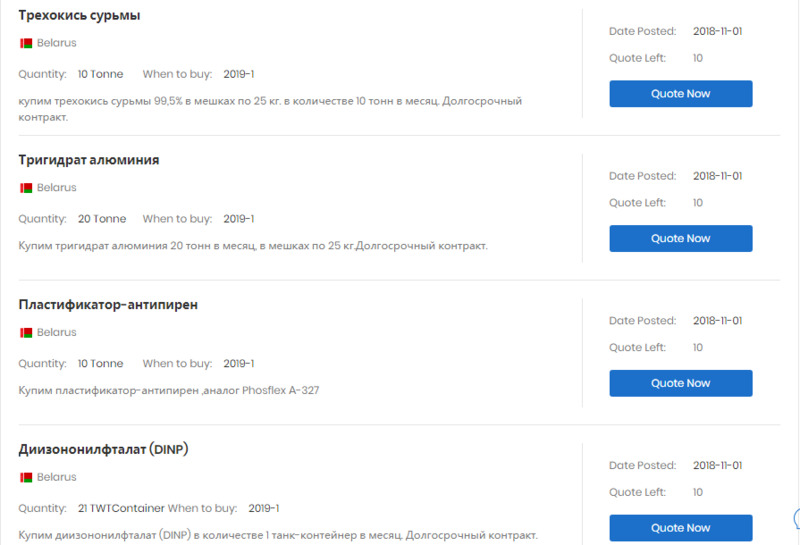 Many local buyers showed great interest in the rich products on our platform, and submitted their buying requests online, including the TiO2, phosphoric acid, polypropylene, PVA, sodium hydroxide, agrochemicals and other medical intermediate. Suppliers on okchem.com can search the buylead and quote for these quality inquiries online. Suppliers from Russia, China, Kazakhstan and other countries were also attracted by our online and offline service solutions. Some of them wanted to get service solutions like the market analysis report of their targeted market, sourcing and sample collection services. Some of them wanted to sell their products on okchem.com to increase sales and grow business. In addition, some research institute also came to our booth to study our B2B business model. The local Russian Chemists Union and Chemical consulting company also highly appreciated the OKCHEM services and discussed cooperation matters with us. One of the diamond suppliers, Taizhou Ruibai Chemical Co., Ltd participated in this exhibition with us. 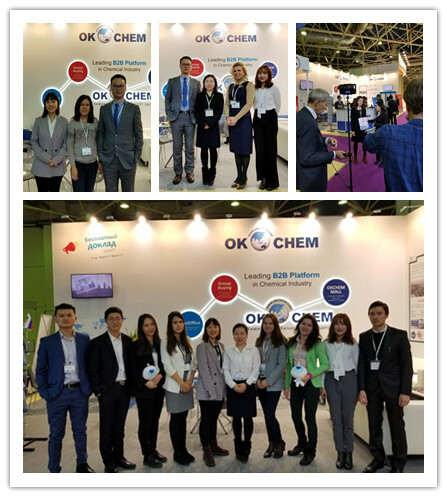 With our professional knowledge and experience, OKCHEM Russian team provided Ruibai with translation service, helped them develop customers and visited local potential customers. The president from Ruibai highly praised our professionalism and looked forward to further cooperation with us in the following exhibitions. In this exhibition, we not only helped Ruibai achieve cooperation with overseas customer, but also displayed samples, brochures and promotional videos of other cooperative suppliers, such as Jiangsu Qingting Washing Products Co.,Ltd , WNC Chemical, LUXI Group CO., Ltd, etc, and helped them win potential customers. At Khimia 2018, we had offered solutions to chemical buyers and suppliers from different sectors in the chemical industry according to their requirements. In the future, we will still keep on working hard to serve all the OKCHEM users, and help them find the most suitable solutions for their business. Whether you are a buyer or seller, OKCHEM will spare no effort to help you expand business in the global market.